Alliance for Green Heat - A Maryland program that provides rebates for select pellet stoves and EPA certified wood stoves has been an overwhelming success for pellet stoves. Of the 773 rebates given since the program started in September 2012, 646 or 83% of them have been for pellet stoves. To date, the Maryland program has provided nearly $400,000 in rebate grants for pellet stoves and $67,000 for wood stoves. The program is only open to families who heat with oil, propane or electricity in order to target those who have highest heating costs and the most carbon intensive fuels. The wood and pellet stove grant program is quickly catching up with the Maryland solar and geothermal grant programs, with 28% of all grants going to wood and pellet stoves and nearly 15% of total funding. The rebates range from $500 for wood stoves and solar hot water to $3,000 for geothermal. All of the programs are designed and managed by the Maryland Energy Administration (MEA) with input from stakeholders and funded from Strategic Energy Investment Fund (SEIF), part of the Regional Greenhouse Gas Initiative (RGGI). “These results show that rebates for pellet stoves can help a state meet residential carbon and electricity reduction goals,” said John Ackerly, the President of the Alliance for Green Heat and one of the advocates for this program. “Per dollar of state funds invested, this has enabled Maryland to help many more families reduce energy costs and drastically reduce their fossil fuel use,” Ackerly added. The greater interest in pellet stoves is result of a combination of factors, including people using the rebate to upgrade from an old, uncertified wood stove to a pellet stove, a higher rebate amount for pellet stoves and not as many wood stoves qualifying for the program’s 3-gram per hour emission requirement. Pellet stoves are held to 2-gram an hour emission limit. Another factor is that pellet stoves are simply becoming more popular in Maryland as they are nationally. The state has one of the premier pellet stove dealers in the nation and a full 58% of the 79 wood and pellet stove grants listed one month were being handled by that dealer, Courtland Hearth & Hardware, that has 3 stores in northeast Maryland. On a per capita basis, the rebate program has been most popular in Harford County and Maryland’s rural eastern shore, a peninsula between the Chesapeake Bay and the Atlantic that has very little natural gas penetration. 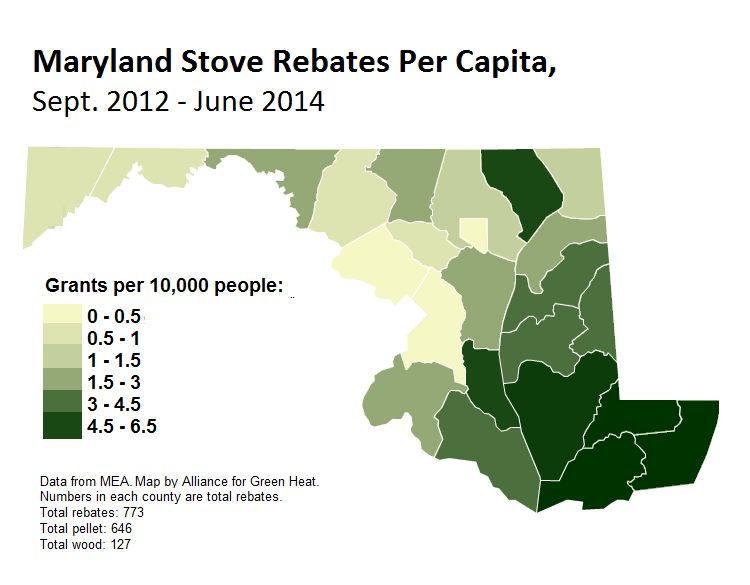 On a numerical basis, the most rebates are in Harford, Anne Arundel and Baltimore County, more heavily populated counties that also have higher median household incomes and can better afford the up front costs of purchasing and installing a stove. 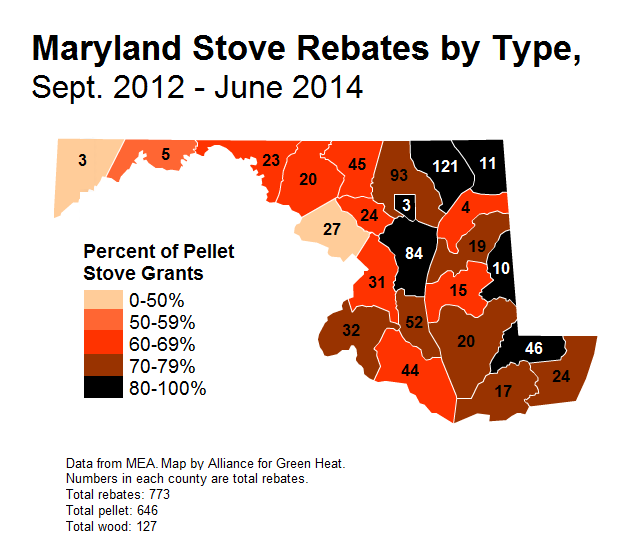 Garrett County, one of Maryland’s counties with the lowest average household income and the highest rate of wood heating, had very few participants in the rebate program and they were only one of two counties that favored wood over pellet stoves. In Maryland, the western counties and the Eastern shore have the lowest average household incomes and the center, which is part of the Washington, Baltimore, Philadelphia corridor are the wealthiest, with the exception of inner city Baltimore. This corridor also has very high rates of national gas penetration. Unlike many programs in other states and areas, where wood smoke is a worse problem, the Maryland program does not require the homeowner to turn in an old uncertified stove to qualify for a rebate. Nevertheless, according to several stove retailers, between 50% and 75% of old uncertified stoves are removed and recycled anyway. 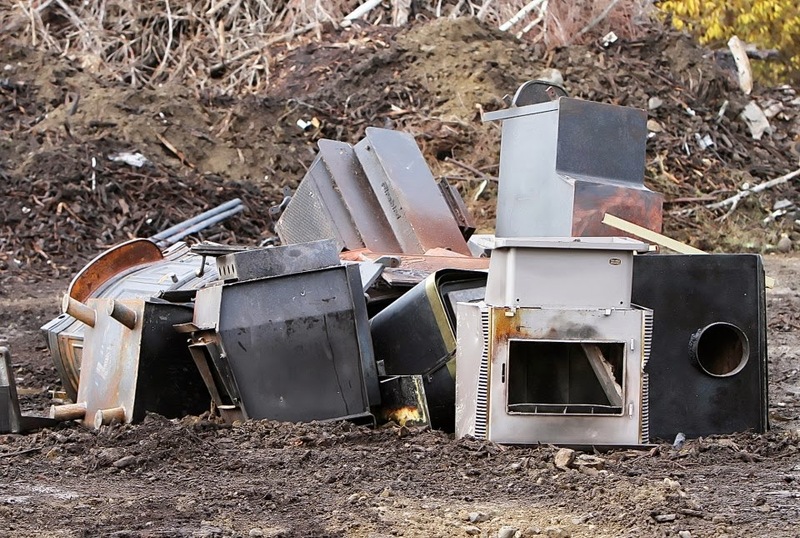 Recyclers usually pay $25 - $40 for old wood stoves. This indicates that a rebate program that requires professional installation can be an inexpensive way to remove old wood stoves from the airshed compared to many change out programs, which tend to be more expensive. The $500 - $700 rebate from the state helps Maryland achieve several objectives. Other than helping people replace or significantly reduce fossil heating fuel, it also steers people to pellet stoves instead of wood ones and leads consumers to buy a cleaner stove and ensures that it is professionally installed and/or inspected, depending on permit and inspection requirements of the county. Without the rebate, it is more likely that more consumers may buy off the second hand market, or buy higher emitting wood or pellet stove, or hang on to an older stove for longer. From a carbon perspective, incenting the purchase of wood and pellet stoves can be a very good investment as a wood or pellet stove is often about 10% of the cost of solar or geothermal and can displace about the same amount of fossil fuel as the typical solar or geothermal installation. Pellet stovesGenerally, pellet stoves are more likely to be a primary or sole heat source for a home because they can be easily run 24/7. From an emissions perspective, pellet stoves are clearly better than wood because the fuel size is small, it has consistent low moisture content and is fed into a more controlled combustion chamber. By limiting the rebate to homes that heat with electricity, oil or propane, the program effectively limits the vast majority of participants to rural areas, where stove emissions are not as problematic. Nationally, wood stoves have always outsold pellet stoves, but pellet stoves have twice come close to selling more than wood stoves annually. Over the five years preceding 2013, manufacturers shipped an average of 90,000 pellet stoves per year versus 137,000 wood stoves, according to data from the industry association, the Hearth, Patio and Barbecue Association (HPBA). The MEA provided the Alliance for Green Heat with a sampling of data from 110 applications. This data helps the MEA and other stakeholders understand which fossil fuels are being offset, what applicants do with old wood stoves and other metrics that can help assess the strengths and weaknesses of the program. It appears that the fossil fuel most commonly displaced was electricity, which was twice as common as oil and propane. It is unclear if electric heating means electric resistance heat or a heat pump and that has a large bearing on the amount of electricity reduced. Many Marylanders have older, inefficient heat pumps that work poorly in very cold temperatures. The application does not ask if the person intended the new stove to be a primary or secondary heat source or whether an old wood or pellet stove being replaced was a primary or secondary heat source. That will be one of the recommendations the Alliance makes to the MEA about future data collection to provide better metrics for the program. Of the 110 applications, 33 of the households already had an older stove. What is surprising is that Pellet stoves have many moving parts and are not as durable as wood stoves and often need to be replaced every 10 – 15 years. Of the 33 households with existing stoves, nearly 60% had their old one recycled or otherwise disposed of. Six of them, or 18%, sold them on the second hand market, including a few old pellet stoves. And 3 people kept their old wood stove installed as an emergency back-up heat for their new pellet stove. Nearly half of these households already had a pellet stove and wanted to upgrade to a newer pellet stove. This analysis is based on much more data but continues the trends that were noted in a similar analysis in February of 2013 after the pilot phase of the program. During the pilot phase, rebates were $400 for wood stoves and $600 for pellet stoves.